Visual: Black. Off white head. Nose: Smoke. Smoked bacon. Medicinal touch. Tobacco pouch. Peat. Smoked sausages. Cannabis*. Bitter coffee. Body: Smoked bacon. Touch of salt. Black cherry. Dark malt flavor. Shortbread. Brown bread. Black olives. Citrus hops. Finish: Smokes sausage, Salt. Beef slices. Barley. Light hop character. Bitter and charring. Peppercorn. Spice rack. Toasted teacake. Light citrus. Conclusion: A good one to end on. Both in that is a good beer and that it has enough weight of flavor to still be noticeable at this point. It is smokey, weighty, malty and more things ending in y. It gives far more weight and flavor than its, not small, abv would suggest. It is a beer that seeps in, with slow reveal of smoke, tobacco and meat. An acquired taste to be sure but a delectable one. It is rich with spice dashed over the meaty core, as if seasoning ready for cooking. The mixing of elements feels very professional and makes for a nice ride through the flavours. It is more smoked dominated that a lot of the beers tried today, a point that I would hold against it if it didn’t use the smoke as an emphasis on the other characters such as smoked meat, or working against strong flavours like the rye spice character. The sheer contrast earns it a lot of forgiveness for the smoke over dominance. There are some light citrus and hop characteristics that are barely evident beneath the main body, but do give a small attempt at keeping it varied. Even with that it is not hugely varied, but the simple push is well done and full bodied. Like a Black IPA made with meat rather than hops. I just reread that last statement. I think I may be drunk. Too heavy to drink too much of, but still excellent in moderation. Treat it like a smoked stout and you will be spot on for the amount you can enjoy. Very nice. Background: Collab Fest 2013! 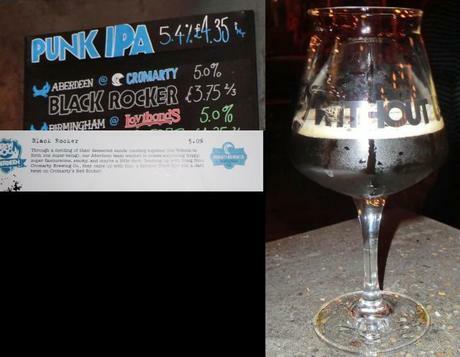 Every Brewdog bar collaborated with a local brewery to make a beer for the fest, resulting in a grand total of twelve beers released over one weekend. So, what could I do? Normally I limit myself to two of three reviews in a session, but these would only be on for the weekend. So, for you, my readers, I sat in one eight hour stint, drinking thirds, with a glass of water and a chapter of Michael Moorcock’s Elric of Melnibone between each drink to help clear my palette. I suffer so for you. This was the twelfth and final beer of the day! Woo, mission complete. After drinking this I returned the empty glasses to the bar and got a high five for completing my quest. Managed to hit first time as well. This is a variant on Comarty’s Red Rocker, a smoked black rye IPA. I hope my write ups have remained legibly despite pulling an all dayer for this one. *Note – I am not an expert on this one I will admit.